The DA-2006 Series is a microprocessor-based instrument that is used in the testing of defibrillators. It measures the energy output and provides information about the defibrillation pulse. It is used on manual, semi-automatic and automatic defibrillators with monophasic or biphasic outputs. 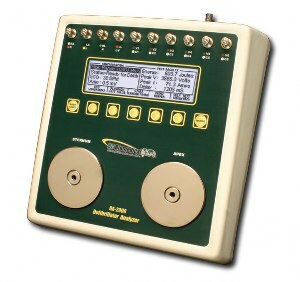 The DA-2006P model also provides a Transcutaneous Pacemaker analysis function. This measures and displays pacer pulse information as well as performing refractory period, sensitivity and immunity testing. All models have a built-in 50 ohm human body simulation load as well as 12 lead ECG with arrhythmias and performance waveforms. Additionally, they have a Centronics printer port, a serial port, oscilloscope output, high-level ECG output and provision for a battery eliminator. The DA-2006 Series makes viewing and selecting the desired waveforms and test data quick and intuitive, with all operational information being available on the 240 by 64 pixel graphic display.